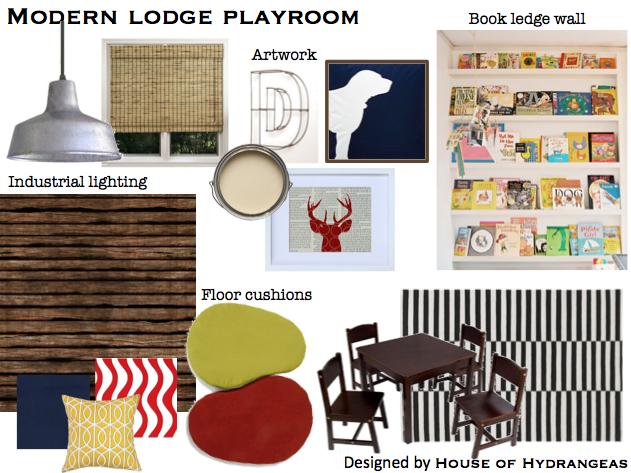 The playroom is going to be in the newly refinished basement (aka man cave heaven), so I didn't want to overload it with a lot of super bright colors and super-themey (too much of something can be a bad thing) decor. Plus, by giving the space a bit of a more mature look, the kids would be able to grow into it and use it for years to come. I used a lot of different materials in the room to give it depth-from the metal barn light and wire letter art to the wooden accent wall and woven bamboo shades (no draperies to pull down!). Aside from varying materials, I wanted to have a lot of big features to balance out the large space. If you're working with a large area, like a basement, you want your furnishings to be large too so they don't become lost in the space. Scale is always important. The book ledge wall, wooden board accent wall and striped rug bring a good balance to the space. They add a lot of interest to the space and carry a subtle repetition (stripes) throughout the space. And when the play days are over, the wooden wall can remain and the book ledge can easily become a picture ledge to house family photos and other memorabilia (man cave style). As far as the color palette goes, I kept it simple with a lot of neutrals for the wall color, window coverings, and furniture. 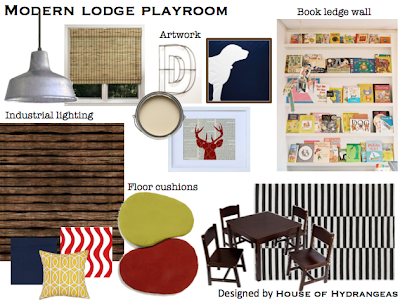 But to add color and vibrancy (it is a playroom after all), I chose to do a twist on the primary color palette (substituting blue for navy blue) to keep the room fun, yet sophisticated. 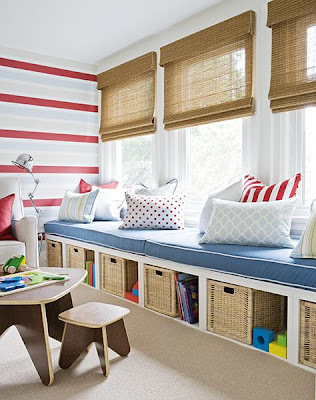 I also suggest building a long bench seat (not shown on the board) with storage underneath (see image below) to house all of the toys. The fabrics I chose would be used for the bench seat cushion (navy) and coordinating pillows (yellow and red). I love the way the design turned out. What do you think?